The subject of conditions in post-World War II Poland remains fraught with practical and moral issues that are difficult to sort through much less encapsulate in a single story. By the 1960s, when the new movie Ida takes place, most of the small number of Jews who survived the Holocaust had left Poland. Some who remained had been raised by Catholic families, and didn’t even know they were Jewish. Other Jews tended to see the Soviet occupiers as allies because of Russian opposition to Hitler and because of what they deemed Polish silence in the face of the murderous Nazi onslaught. Director Pawel Pawlikowski, who was born in Poland, educated in Britain and who now resides in Paris, wades into this morass with a simply presented movie that harbors many complexities. Pawlikowski (Last Resort and My Summer of Love) tells the story of Ida, an 18-year-old novitiate at an austere Polish convent. Just before Ida is about to take her final vows, her mother superior tells her that she must visit an aunt she didn’t know she had. The aunt, a disaffected judge, tells young Ida who her parents were, and that she’s actually Jewish. The drama unfolds from there. Artful black and white images served up by cinematographers Lukasz Zal and Ryszard Lenczewski, an old-fashioned aspect ratio that squares those images, and carefully considered compositions make Ida one of the least casual movies of the year. Nothing in Ida seems idly expressed. The movie has been compared to the work of Swedish director Ingmar Bergman and French director Robert Bresson, but reminded me of some of the work that was coming out of the National Film School in Lodz in the 1960s. Like Roman Polanski, who trained at Lodz, Pawlikowski tries to advance his story visually, minimizing dialogue and narrative beats: His compositional sense is commanding and slightly off-kilter: He places subjects on the edge or bottom of the frame, often surrounding them with space that practically swallows them. Young Ida, played by newcomer Agata Trzebuchowska, is a wide-eyed girl who knows nothing of the world. She was sent to the convent as an infant, has no real knowledge of how she got there and has been on track to become a nun for as long as she can remember. She’s evidently deeply faithful. Trzebuchowska has the kind of face that seems open but reveals little. I suppose Pawlikowski wants us to wonder what’s happening to Ida internally as she confronts a series of difficult truths. The brilliant Polish actress Agata Kulesza portrays Ida’s aunt Wanda, a Jewish woman who drinks, chain smokes and proves entirely dissolute when it comes to men. Wanda’s clearly trying to numb her senses because there’s nothing in her life but pain. She still has some Communist Party juice, which she’s not afraid to use, but if Wanda ever believed in anything, the foundation of those beliefs long ago turned to ash. The bulk of the movie involves a road trip taken by Ida and Wanda. The duo searches for the spot where Wanda’s sister and Ida’s parents were buried. Their mission brings them into contact with a farmer who now occupies the rural home that once belonged to Ida’s family. At a nearby hotel, Ida and Wanda also meet a young saxophone player (Dawid Ogrodnik) who’s enamored with John Coltrane and who seems as if he dropped in from another movie. That may be the point: His presence underscores the insularity of Ida’s world. The film reaches one resolution and then continues carrying its burden toward a second set of conclusions. It’s just here that Pawlikowski began to lose me in a rash of second guesses and doubts about the behavior of both Ida and Wanda. As much control as Pawlikowski has over his images, I’m not sure he has an equal amount of sway over the developments that provide the movie with its final act. 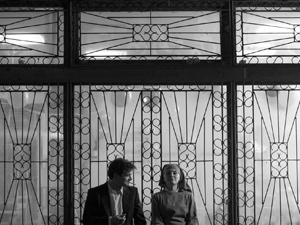 To me, Ida seems more like a compelling starting point for consideration of the complex issues Pawlikowski raises than a fully realized drama about those issues. Applications for that job still are being accepted.